Thursday Customs has recently rolled out a new product, the USB Boy. The device functions like an Arduinoboy in every way, except for the fact that it lacks USB ports. For ages, the integration of LSDJ and other Gameboy music software into a Digital Audio Workstation (DAW) has been a thing of mystery and awe. In this feature we’re going to go into detail as to how you can take advantage of this MIDI port-less device to open up your world of mobile production and composition. Click here for a full video review, read on for more details! The LSDJ MIDI OUT + Live Sync patch is something that first appeared in 2011 and was something experimental in nature – essentially, LSDJ was used as a MIDI sequencer as well as a tracker to generate noise out of the Gameboy. This meant that anything you could hook up to a MIDI cable via Arduinoboy could be programmed/played by a Gameboy to some degree. Some artists such as Auxcide exploited this on a brutal level, using as many as 4 or more synths and 6 or 7 Gameboys in unison to create jaw-dropping textures and tunes. The Sync maps allowed for the Gameboy to be slaved to receive special MIDI data rather than send it. One example would be creating loopable tunes in Ableton Live or other session-based DAWs with MIDI loops corresponding to certain chains in LSDJ. This allows for Live mode utilization in LSDJ without touching the Gameboy, handy for strictly sequenced tunes and heavily improvised jam sessions alike. Application for the USB Boy includes things such as being able to compose on the go, and feed note data into a DAW. The if LSDJ’s tempo matches your DAW’s master tempo, recording note data is as easy as hitting the record button in your DAW then pressing START on the Gameboy. Benefits of this are being able to track songs for DAW usage while away from the computer, as well as sending data in realtime to control things such as DMX lighting or effects loops in DJ software. One could easily record their song data as MIDI and use those MIDI files in VJ software with both LSDJ and the USB Boy set to Master, enabling someone to create highly detailed visuals to go with their music. MIDI OUT is a spectacular function, and MIDI IN via the LSDJ keyboard mode and midiGB software allow for spectacular exploitation of realtime Gameboy performance at its highest level. The LSDJ keyboard was designed years ago to enable LSDJ users to perform their tunes live, on one channel at a time, and have better input for their compositions on the Gameboy. With the USB Boy those same functions are still present, with the option to use a real USB MIDI keyboard or finger drumming controller such as the Novation Launchpad or MIDI Fighter to provide note input. For some folks, one channel in LSDJ isn’t enough, and they crave more input. The midiGB ROM is a free homebrew software for the Gameboy that allows for simultaneous yet independent control over the pulse, wav, and noise channels. The catch is that while these sounds are highly modifiable and extremely easy to color (MIDI CC’s will change parameters), it typically can’t outperform the level of detail LSDJ can create in sound design. midiGB is definitely a go-to option for keyboardists wishing to jam on a Gameboy as a hardware synth along with soft synths in their DAW or even other hard synths. Another excellent opportunity for compositional freedom is the LSDJ keyboard function of the USB Boy. It is possible to map MIDI controllers to certain notes and macros that are user-defined, allowing for a custom workflow. Gone are the days of having to locate and modify a compatible PS/2 keyboard or punch in entire songs with your thumbs. The power is in your hands and under your fingers to utilize MIDI automation and MIDI controllers to create a workflow that fits your needs. Currently there is support for using only one Gameboy with the keyboard function at a time, but that may change as time goes on and LSDJ and the USB Boy are developed further. A change in the composition process by using MIDI controllers may be frustrating or liberating, but always flexible given the nature of MIDI mapping, something the PS/2 keyboard modification doesn’t allow. It’s no secret that producers like Savant, Frostbyte, and Whitely use LSDJ now and then in their productions, often using LSDJ as both a creative exercise away from their computers as well as a core part of their sound design now and then. The USB Boy allows for fundamental tempo sync, meaning you can record from your Gameboy straight into your PC without the need to warp the audio to the correct tempo, as the Gameboy without external sync tends to drift. This also means it’s easy to sample, resample, and reapply your chippy sounds in new creative ways in your computer productions. It’s easy to make your creative cover tunes remixes with a vocal acapella, and expand your own LSDJ works with more synths, drums, and other sounds. It also makes it easy for folks who mix and master their own LSDJ releases to draw automation over their individually recorded tracks for things such as EQ and effects, again a consequence of not needing to warp the tracks to drift-less beat grid. As far as integration with computer productions, the sky’s the limit. Catch me and the USB Boy in action! We’ve already touched upon the USB Boy providing the capability of live jamming in LSDJ and midiGB, but what about enhancing LSDJ-only performances? Or integrating your Gameboy tunes into a live band? Well, after doing extensive (read: completely unplanned and unrehearsed) testing, I found that it is profoundly easy to take your LSDJ game to the next level with the USB Boy. How easy is it? Read on for my personal anecdote. Back in late December, I received the USB Boy prototype from Thursday Customs, asking that I provide a thorough examination, beating, and testing of the device where possible. As luck would have it, I was invited to play in a friend’s band the following month: Matt Owen and the Eclectic Tuba. They had a song called “Hyperdrive” which almost felt like an old Anamanaguchi tune, minus the NES. I asked Matt what I would do, and he said “play along, and solo,” which sounded great on paper. Matt’s band uses two laptops running Ableton Live to drive background instruments (like rhythm guitar recordings), send a tick to the drummer, filter in vocals and instruments for EQing, and provide softsynth support for the two keyboardists. For me to be properly mixed into a band whose drummer operates on a metronome tick, I needed to make sure my Gameboy was in time with that tick. Rather than simply press “play” on my sequenced part of their song (and solo section I pre-wrote), I thought it would be wise to bring the USB Boy and hook it up to Matt’s rig. When I arrived at the bar, soundcheck took only seconds and I was nervous. I had not used the USB Boy too much yet, and was afraid I might not be able to play on the tune. However, as soon as I plugged the USB Boy into Matt’s Macbook Pro, drivers installed themselves, and when Ableton was loaded up, there was the “Teensy MIDI” device (the USB Boy) ready for action. Making sure to turn on the appropriate output functions, I threw the USB Boy into LSDJ slave mode. Later when it was time for Hyperdrive, it was as easy as turning on the Gameboy, putting LSDJ in slave mode, and then cuing up my segments while the band jammed and Ableton sent MIDI data to the USB Boy. I even have video from the gig! Here’s footage of the whole ordeal! 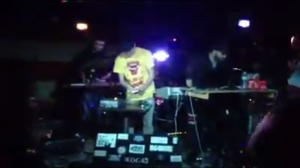 You’ll notice that something rhythmically was off – the band swung and the Gameboy didn’t. The big caveat here was that on the album, where I learned to program the song, the song was not swung. This was an overlook by myself and the band, which will be properly compensated for next time when we play together in March by taking better advantage of LSDJ’s Groove function. Overall the performance was awesome and the Gameboy mixed very well with the band. And shockingly, it was easy to jam along because the USB Boy was literally plug and play, aside from setting it up as a device in Ableton which took literally a few seconds. In the LSDJ scene there has always been a special pedestal for artists who rock a 2xLSDJ setup, typically with a DJ mixer. Notable acts to do this include Knife City, Trey Frey, Roboctopus, and Galaxy Wolf. The big deal with doing live performance at clubs and bars with LSDJ is not only having a decent sized live audience, but also being able to approach performance more from the DJ end of the spectrum. This means effects, EQ tweaking, and transitions are huge parts of the performance. Often, hardware mixers cost upwards of $100 and provide the bare necessities for LSDJ: amplification, EQing, and a few basic effects. Some folks use devices like Kaoss Pads and guitar pedals to help color their sound, which adds more money to the live setup. Most bars use mono-oriented sound systems, meaning stuff like panning effects doesn’t really matter much and will have no effect in these venues. It’s possible to use mono-output in clubs to your advantage, as well as DAWs such as Ableton or FL Studio to design a highly capable software mixer on your laptop. Other software such as Guitar Rig, Izotope’s Trash, and even Traktor can be used to make your performance setup be feature-rich without breaking the bank. Expect an article soon detailing this process using the USB Boy! These techniques will work with 1xLSDJ works as well. Keep your eyes peeled! In addition to being able to layer all sorts of effects, sometimes the ability to sidechain Gameboy audio fed into your computer make a world of difference – using high quality drum samples to beef up your tunes can help bring your sound design up to most standards held in EDM, especially with a bit of creative EQing. Stay tuned for more articles in the future about MIDI and its uses with LSDJ, we’ve barely scratched the surface!